"Samists and Fr. Vincent Lebbe at the Monastery of the Beatitude"
Samists and Fr. Vincent Lebbe In front of the cross of the monastery of the Beatitude. Writings on the back: “Christ between two bandits. Which one is the good one?“ Center: Fr. 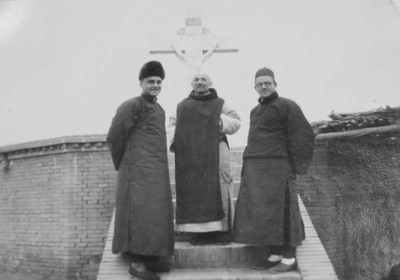 Vincent Lebbe in Little Brothers’ garb; to his right: Fr. Paul Gilson; to his left: Fr. Raymond de Jaegher. Samists and Fr. Vincent Lebbe at the Monastery of the Beatitude. December 25, 1933. Société des Auxiliaires des Missions (SAM) China Photograph Collection, Whitworth University Library, Spokane.